[Fontana, Calif.] WF Taylor, a manufacturer of floor covering adhesives and floor preparation products, announced the launch of its new Cradle to Cradle certified Taylor TruRenew pressure sensitive adhesive. According to Kristine Elledge, marketing coordinator and creative graphic designer at WF Taylor, the new Taylor TruRenew product line utilizes bio-sourced raw materials to replace common petroleum-derived raw materials and creates a patented adhesive chemistry unique to the flooring industry. Elledge said that it’s been a growing concern of the industry to reduce the dependency on petroleum, which is a nonrenewable resource, and replace that dependency with sustainable, renewable resource technology that is safe and good for the environment. “There is a growing move in this country, and for that matter our world, towards safe, environmentally focused product technology that utilizes sustainable agro-chemicals rather than petrochemical sources,” said Elledge. 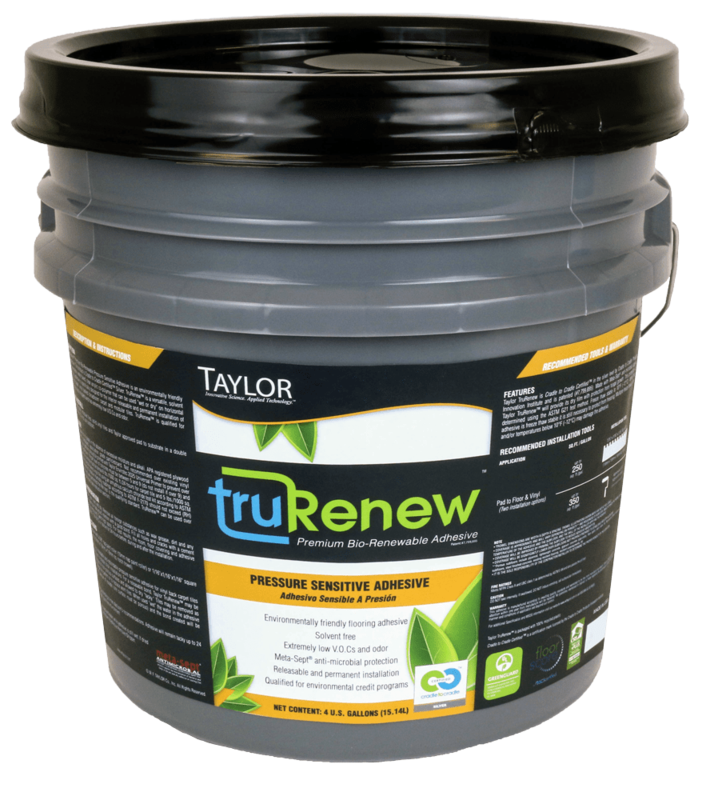 She added that developing a product like TruRenew is a result of the innovative culture that has been cultivated by Taylor’s management and ownership over the years; the R&D team is encouraged to think outside the box. “It also involves partnerships with raw material manufacturers. This enables us to harness cutting edge technology developed by these companies,” she said. TruRenew provides releasable and permanent installations of vinyl backed carpet, modular carpet tile, solid vinyl tiles and carpet pad. It is also certified by Greenguard, CRI Green Label Plus and RFCI FloorScore Indoor Air Quality programs, and meets requirements for LEEDv4 credits. “It is Taylor’s most green/environmentally friendly flooring adhesive ever to hit the market,” Elledge said. According to Gary Liddington, business manager of manufacturing brands, having an adhesive Cradle to Cradle certified gives external verification of a product’s sustainability and safety for humans and environmental health. This product being Cradle to Cradle certified is especially significant because this product is the first wet adhesive to be certified, and the Cradle to Cradle certified mark provides consumers, regulators, employees and industry peers with a clear, visible and tangible understanding of WF Taylor’s commitment to sustainability.